The Val Ramos Flamenco Ensemble is one of the best Flamenco fusion groups in the United States. Established in 1994, the group features the unique talents of VAL RAMOS (lead Flamenco guitarist), JOSE R. RAMOS (Flamenco guitarist), KRIS JENSEN (flutist and saxophonist), CARLOS HERNANDEZ CHAVEZ (bassist), ASHLEY JONES (violinist), and MATT MOADEL (cajon player/percussionist). The ensemble often performs with international Spanish Flamenco singing sensation ALFONSO CID. The ensemble also performs with guest Flamenco dancers and other musicians from Spain and the United States. Hailed as “the best of classical Flamenco brought to modern standards” (Rootsworld.com), “a hidden treasure of the Flamenco world in the Americas…superb musicianship..” (Flamenco Connection), and “simply brilliant” (Flamenco Buzz.com) this outstanding musical group represents the best of contemporary Flamenco music, song, and dance. The Val Ramos Flamenco Ensemble has released three albums of original Flamenco music and song, all on the PIRAM Records label–Por mi camino (2001), Boricuas Flamencos (1998), and Olive Green Eyes (1995). The ensemble has been featured in major international music festivals including the International Festival of Arts and Ideas, the Regattabar Spring Jazz Festival, the Litchfield Jazz Festival, the Levitt Pavilion Summer Concert Series, Summerwind Concert Series, and the Guitar Under the Stars Festival. In July 2005, the ensemble toured Spain under the auspices of the United States Embassy in Spain. 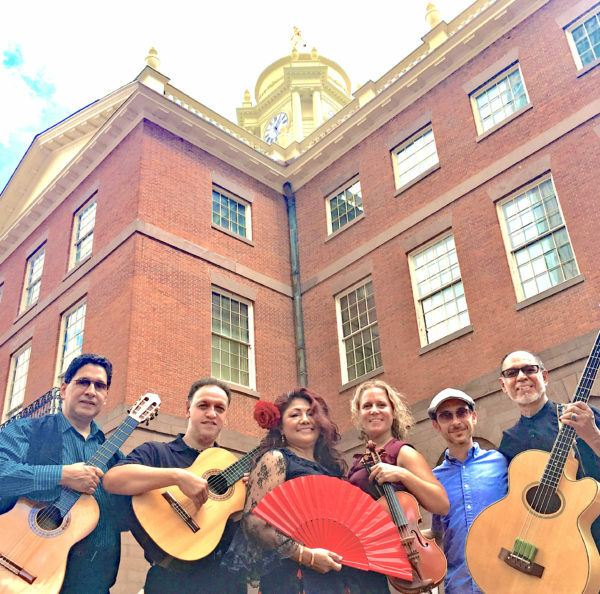 The group has been featured in National Public Radio (NPR United States) and Radio Nacional Española (RNE Spain) interviews in the radio shows “All Things Considered,” “The Faith Middletown Show,” and “La hora de America.” The group’s music is featured in several documentary films including “Puerto Rican Passages” (Connecticut Public Television) and “Nuyoricans” (WNET-Thirteen/PBS). It has also been featured in The New York Times, the Boston Globe, the Hartford Courant, the New Haven Register, and, in Salamanca, Spain, in La Gaceta and La Tribuna. Most recently, the group has been featured on the CT Stage 8 noon variety show produced by the ABC affiliate WTNH-Channel 8. The ensemble has performed with internationally-renowned Grammy singers the legendary CELIA CRUZ and DANNY RIVERA. It has also performed with some of the best Flamenco artists from Spain and the United States including ALFONSO CID, DOMINICO CARO, JOSE DE SANTOS, DAVID CASTELLANOS, CRISTOBAL CINTRON, and ARTURO MARTINEZ, and dancers DIONISIA GARCIA, MELINDA MARQUEZ, REBECA TOMAS, and BARBARA MARTINEZ, to name a few. Ashley Jones is available for private + group violin instruction. She is also available for professional performance bookings both individually + with her bands.